The Vans Surf Pro Classic returns to the iconic surf break of YoYo’s in Lamberts Bay for its third edition which has been boosted by upgrading the World Surf League (WSL) Qualifying Series (QS) men’s event to a QS1,500 rating alongside the QS1,000 women’s and JQS1,000 junior men’s events. Scheduled for Friday to Sunday, 1-3 June, the entry lists for all three events are full and the bustling West Coast fishing village will be bursting at the seams as competitors from as far afield as Hawaii, USA, Australia, South America, Europe, Mauritius and Japan arrive to test their skills at the break dubbed the ‘Trestles’ of Africa after the outstanding waves experienced in the past two years. “Vans are really happy to be able to bring the 3rd annual Vans Surf Pro Classic back to Lamberts Bay this year,” says Vans Marketing Manager, Warren Talbot. “This is definitely one of our most favourite events of the year and Lamberts Bay offers a highly contestable wave for all our competitors. The total prize-purse has almost tripled to R190,000 and the coveted points on offer on both the international and regional rankings determine their qualification for and seeding in major events worldwide. The junior men also earn points that count towards selection of the WSL Africa squad who will represent the region in the annual World Junior Championships in Australia in January 2019. David van Zyl (Glenashley), the 2017 Vans Surf Pro Classic runner-up, heads the men’s seedings and will be determined to go one better this time. Van Zyl, winner of the first event on the 2018 WSL Africa QS in Port Elizabeth in March, faces tough opposition from the likes of 2016 Vans winner Beyrick de Vries (uMhlanga), current regional rankings leader and 2016 Vans junior men’s champ Jordy Maree (Kalk Bay), Australian Jordan Lawler and a host of others. The women’s field is also headed by last year’s runner-up, Hawaiian Zoe McDougall, who will be challenged by the vastly experienced all round French surf star Justine Dupont. The South African contingent includes international campaigner Tanika Hoffman (Cape Town), regional rankings leader Nicole Pallet (La Lucia) and rising stars Kai Woolf (Jeffreys Bay) and Zoe Steyn (East London). The third edition of the event will again be hosted by the local West Coast Boardriders Club with the invaluable assistance of the volunteers from Christian Surfers South Africa. Live scoring for the Vans Surf Pro Classic, along with results, images, video footage and news will be available at www.worldsurfleague.com. The Vans Surf Pro Classic is proudly supported by Vans, Zigzag, Hydro Flask, WSL and SSA. Masencamp and Slijpen were the form surfers on the final day with the former delivering the two highest heat totals, 15.75 and 15.25 (each out of 20), in Round 4 and the semi-finals, while Slijpen produced a near-perfect ride that was awarded 9.0 by the judges in his semi-final. The men’s final was an anti-climax after the great surfing that went on earlier with current WSL Africa rankings leader Jordy Maree (Kalk Bay) and Masencamp only managing to produce short rides as they searched the length and breadth of North Beach. With five minutes remaining and Maree holding the lead with a heat high 5.25, Masencamp found a wave that produced some workable sections and the 18 year-old from the Strand smashed an 8.0 point score. Along with his backup of 2.90, Masencamp’s 10.90 heat tally was enough for him to clinch his first QS event title in South Africa. “It was a very tricky final and I didn’t have a great start,” Masencamp explained. “In the beginning Jordy had better waves, but then a bomb came through and I capitalised on it. Maree continued to chase more waves and added a 4.0 to his tally but he was unable to overtake Masencamp’s total and had to settle for second place, which ensured that he retained his lead in the regional rankings. On his way to the final Masencamp eliminated local favourite and top seed David van Zyl (Glenashley) in a high scoring, man-on-man semi-final and also finished in first place in a stacked Round 4 heat that included van Zyl, Steven Sawyer (Jeffreys Bay) and Ethan Fletcher (Kommetjie). Maree’s path to the final included ousting Durban local Chad du Toit in their semi clash after heading a Round 4 lineup that included du Toit and Jeffreys Bay residents Joshe Faulkner and Dylan Lightfoot. 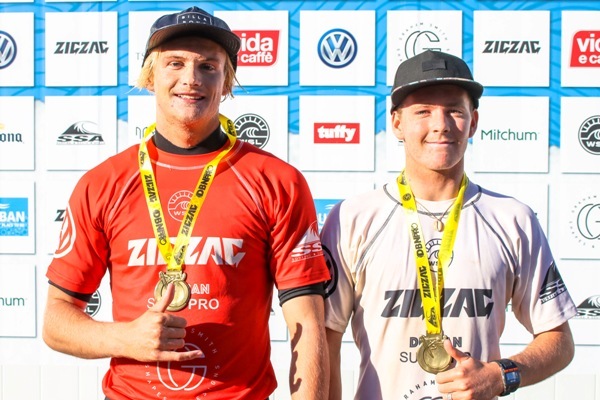 Slijpen, who has honed his skills in the frigid waters and hollow waves of Llandudno on the Cape Peninsula, earned his maiden WSL Junior Qualifying Series (JQS) title in just his third appearance in a final. He posted a narrow victory over Bryce du Preez (East London), Aya Gericke (Wilderness) and Calvin Goor (Salt Rock). The win saw him leapfrog into the lead on the WSL Africa JQS rankings where he has set his sights on finishing in the top four at year end to secure a spot in the squad that will represent the region in the WSL World Junior Championship in Australia in January. Slijpen will also be hoping to carry his form into the next event on the WSL Africa schedule, the Vans Surf Pro Classic that runs from 1 to 3 June at YoYo’s in Lamberts Bay. He finished third in his semi-final last year at the wave that is touted as the ‘Trestles of Africa’ due to its high performance characteristics. The women’s champions in the Zigzag Durban Surf Pro pres. by G-Force were crowned on Saturday with Zoe McDougall (Hawaii) successfully defending her QS1,000 women’s title and Kai Woolf (Jeffreys Bay) clinching her third consecutive JQS1,000 event win of the year. Full results, photos and video footage will be available on www.WorldSurfLeague.com and on the WSL App, with highlights on the WSL QS Facebook, Twitter and Instagram accounts. The two winners justified their top seeding in the World Surf League (WSL) Qualifying Series (QS) 1,000 women’s and Junior Qualifying Series (JQS) 1,000 events, with McDougall successfully defending the title she in Durban won last year and also finishing runner-up to Woolf in the junior final. The pair were evenly matched in the 25 minute final but the Hawaiian found the better right breaking waves while Ane, a goofy-foot who surfs with her right foot in front, chose to ride the left breaking waves in the middle of the beach that provided less opportunity to score highly. To reach the final McDougall eliminated South African surfing legend and former Women’s Masters World Champion Heather Clark (Port Shepstone) in a lopsided semi-final while Ane got the better of Teal Hogg (Shakas Rock) in their last four clash. The junior final was a see saw event with Woolf paddling out late and having to play catch up as her opponents had already posted scores. But the exciting goofy-footed talent from Jeffreys Bay stayed patient and only surfed four waves, taking the lead with rides of 5.25 and 6.50 (both out of 10) for a heat total of 11.75 that her rivals could not match. McDougall rode 12 waves with the best two netting her 10.75 while the fast improving Zoe Steyn (East London) featured in yet another final and finished just ahead of surprise finalist Ceara Knight (Cape Town), who was competing in her first WSL Africa event of the year. Earlier in the day the QS1,000 men’s event saw the top seeds enter the fray in the Round of 32 and set up a classic finals day on Sunday with David van Zyl (Glenashley), Dylan Light foot (Jeffreys Bay), Jordy Maree (Hout Bay) and Shane Sykes (Salt Rock) all posting heat wins. The top ranked competitors justified their seeding in the Zigzag Durban Surf Pro pres. by G-Force with all but two out of 24 advancing to the next round of their respective events on the opening day the World Surf League (WSL) Qualifying Series (QS) events at North Beach in Durban. Classic conditions and small but contestable one metre waves prompted the organisers to get stop No. 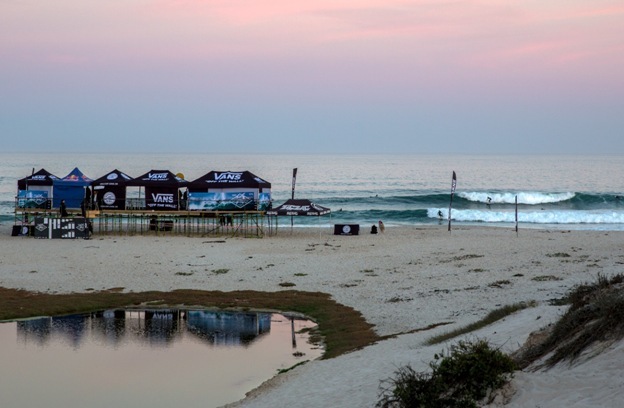 4 of 13 in the WSL Africa Qualifying Series (QS) underway at 7 am. A total of 24 heats were completed starting with QS 1,000 Men’s and Women’s events and followed by the Junior Qualifying Series (JQS) Men’s and Women’s heats for surfers 18-and-under which closed out the day’s action. KwaZulu-Natal locals reveled in their home surf with veteran campaigners Brandon Jackson (Durban North) and Dan Redman (uMdloti) both blasting their way through two rounds to reach the last 32 in the men’s event. Rising star Bryce Burness (Berea) bagged a pair of seven point rides to post a heat total of 14.75, the highest of the day in the men’s event while Capetonians Luke Slijpen (Hout Bay), Ford van Jaarsveldt and Max Elkington (both Kommetjie) all racked up heat wins. 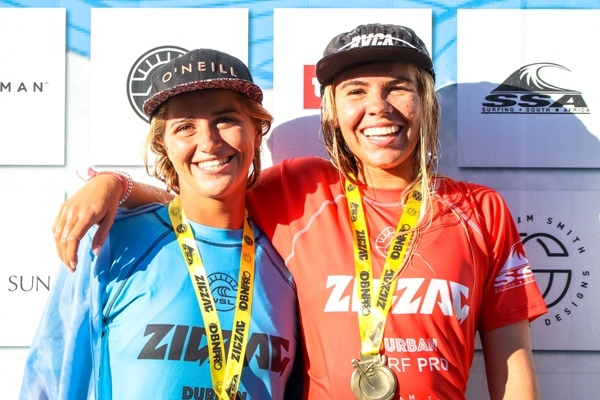 Defending women’s event winner Zoe McDougall (Hawaii) and Josefina Ane (Argentina), winner of the second series stop in Port Alfred in March, got their campaigns underway with comfortable victories. But it was Nicole Pallet (La Lucia), the highest ranked South African in the women’s field who delivered the highest heat total of the round with 12.50 out of a possible 20. Only two junior men’s heats were run which saw Mitch du Preez (East London) and Karl Steen (Durban) top their Round 1 heats and advance to the last 16 alongside their respective heat runners-up in Daniel Orpen (Knysna) and Daniel Emslie (East London). McDougall produced a stunning display of competitive surfing in her junior women’s heat, the last to be run on the day, posting a near-perfect score of 9.25 to go with an earlier excellent 8.75 for an superb heat tally of 18.0. The Hawaiian, who spends a significant amount of time in Jeffreys Bay with her partner Matt McGillivray, also earned scores of 7.75 and 6.50, which did not even factor into her two counting rides. WSL Africa junior women’s rankings leader Kai Woolf (Jeffreys Bay) eased her way into the last eight with a comprehensive heat win and was joined by fellow heat winners Kirsty McGillivray (Jeffreys Bay), the current No. 2, and Kayla Nogueira (uMhlanga), the defending event winner. Organisers will meet at North Beach at 7.00 am local time on Saturday to make a call on when to get the contest underway. The women’s and junior women’s event champions will be crowned on Saturday afternoon while the men’s and junior men’s winners will be determined on Sunday. Former world surfing champion Shaun Tomson will host the Golden Jubilee celebrations for the historic 50th edition of the Ballito Pro presented by Billabong which will be run at Willard Beach in KwaDukuza from June 25 to 1 July. Tomson has played a huge role in the history of the world’s longest running professional surfing event. His late father Ernie was instrumental in founding the Durban 500 back in 1969 and Tomson won the Gunston 500 for six consecutive years from 1973 to 1978, a record that is unlikely to be surpassed at this or any other major international surfing contest. The former Durbanite, now an internationally acclaimed motivational speaker, author and film-maker who resides in California, will spend more than a month in KwaDukuza conducting a Positive Wave Tour comprising motivational workshops with business, council and various high schools leading up to and continuing after the festival. The tour will culminate with 67 minutes of work at a selected high school to celebrate the Centenary of Nelson Mandela’s birthday on 18 July. Tomson will be honoured at a glittering awards function on Wednesday 27 June at Coco Der Mer in Ballito alongside the other South African winners of the event. They include two-time and defending champion Jordy Smith (2010 & 2017), Ricky Basnett (2006) and Gavin Rudolph, winner of the inaugural edition in 1969. This year’s edition of the Ballito Pro Surf Festival also celebrates the tenth anniversary since it relocated from Durban to KwaDukuza and the 21st year of the Billabong Junior Series presented by BOS which has played a pivotal role in grooming young South African surfers for future competitive success. The Ballito Pro Surf Festival kicks off with the Billabong Junior Series pres. by BOS from June 22 to 24 before the crown jewel of the festival, the QS10,000 Ballito Pro pres. by Billabong, and the QS1,000 Ballito Women’s Pro pres. by Billabong take centre stage from Monday to Sunday, June 25 to 1 July. Alongside the surfing, visitors will be spoiled for choice with non-stop activities providing even more entertainment throughout the Ballito festival site. South Africa’s hottest musical acts appealing to all tastes – rock, pop, hip hop, kwaito, electro and dance – will be performing live on Salt Rock Beach over the last weekend. Beach and extreme sports, culinary contests as well as quality retail and food stalls will captivate visitors at this coastal holiday highlight. The Ballito Pro pres. by Billabong is proudly supported by the KwaDukuza Municipality, Billabong, Capitec, Casio G-Shock, Ballito Junction Regional Mall, Coco Der Mer, 5FM, Monster Energy, Zigzag Surfing Magazine, World Surf League (WSL) and Surfing South Africa (SSA). 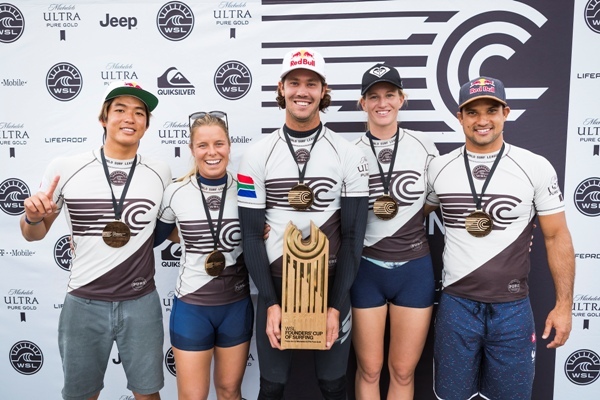 LEMOORE, Calif./USA (Sunday, May 6, 2018) – The World Team captained by South Africa’s Jordy Smith made history by winning the inaugural World Surf League (WSL) Founders’ Cup of Surfing presented by Michelob ULTRA Pure Gold in California on Sunday. The first-ever official event at the WSL Surf Ranch, in front of a sellout crowd, was a showcase of incredible surfing and competition as the world’s best female and male surfers battled in teams for their home countries. World Team was spearheaded by South African pair Jordy Smith (Team Captain) and Bianca Buitendag and superbly backed up by Michel Bourez (Tahiti), Paige Hareb (New Zealand) and Kanoa Igarashi (Japan). The Brazil Team finished second, fractionally ahead of USA and Australia. Captain Gabriel Medina opened their final with an amazing 9.67 ride, the highest score in the Final. Toledo, Silvana Lima, Adriano de Souza, and Taina Hinckel pushed progression to new heights with miraculous tube-rides and imaginative aerial maneuvers. The WSL Surf Ranch facility, which was revealed online to the public in December 2015, boasts the best man-made wave in history – a 700-yard, high-performance, bi-directional wave featuring barrel sections and maneuver sections. Primarily existing as a testing facility, the Lemoore site has spent the past two years dialing in the technology under the guidance of 11-time WSL Champion Kelly Slater (USA) and feedback from visiting WSL surfers. A private test event last September proved very successful, paving the way for the Founders’ Cup of Surfing presented by Michelob ULTRA Pure Gold to be the first time the public will be allowed onto the grounds. For more information, please visit www.WSLFoundersCup.com . South Africa’s Jordy Smith (Durban) will captain the World Team in the World Surf League’s (WSL) groundbreaking inaugural Founders’ Cup of Surfing presented by Michelob ULTRA Pure Gold this weekend. Taking place at the WSL Surf Ranch in Lemoore, 200 kms from the California coastline, the 5,000-strong capacity crowds are expected to watch USA, Brazil, Australia, Europe and World Teams compete on the best man-made wave in history over the two-day competition and festival, May 5-6. In a series of WSL firsts – the first time the WSL Surf Ranch opens its doors to the public, the first live national broadcast in the USA, and the first co-ed, continental team-based competition format – the WSL Founders’ Cup of Surfing pres. by Michelob ULTRA Pure Gold will introduce an exciting new dimension to competition this weekend in Central California. Smith, a two-time runner-up for the world title (210, 2016), leads a powerful squad comprising fellow South African Bianca Buitendag (Victoria Bay), Tahitian powerhouse Michel Bourez, third-year CT competitor and representing his Japanese heritage Kanoa Igarashi, and veteran New Zealand talent Paige Hareb. The other five-person teams include Australia, USA, Brazil and Europe. The squad from ‘down-under’ is one of the strongest on paper with 11 World Titles between captain Stephanie Gilmore, Mick Fanning, Joel Parkinson, and back-to-back WSL Champion Tyler Wright, along with Matt Wilkinson. Brazil Team boasts two of the world’s most exciting surfers in captain Gabriel Medina, the 2014 WSL Champion, and Filipe Toledo, the winner and runner-up respectively of the Future Classic at the wavepool in September last year. Joining those two are 2015 WSL Champion Adriano de Souza, seasoned veteran Silvana Lima and one of the country’s best up-and-comers, Tiana Hinckel. Europe Team has a combination of talent that spans across the continent, including one of the world’s best tuberiders, Jeremy Flores (FRA); 2017 CT rookies Frederico Morais (PRT) and Leonardo Fioravanti (ITA); a Californian charger representing her German heritage in Frankie Harrer (DEU); and is led by Johanne Defay (FRA), one of the most consistent and progressive women on the CT.
USA Team looks to keep the inaugural Founders’ Cup on home soil with the wave system visionary himself, 11x WSL Champion Kelly Slater. In his first event back after sustaining a foot injury last year, Slater leads a strong team including back-to-back WSL Champion John John Florence, 3 x WSL Champion Carissa Moore, and two Californians Lakey Peterson (Santa Barbara), and CT veteran Kolohe Andino (San Clemente). All the action at the Founders’ Cup can be watched live via the internet from approximately 5pm (South African Time) on each day, streamed across new WSL partner, Turner Sports’ Bleacher Report Live, and on WSL platforms, WorldSurfLeague.com and the WSL app. Globally, the WSL’s Facebook page will live stream the event, and the event will be broadcast on television in more than 100 countries. Thanks to presenting partner Michelob ULTRA Pure Gold, fans can enjoy great views of the competition from the Michelob ULTRA Pure Gold Impact Zone at the North End of the pool. Share your stoke with the perfect selfie, free giveaways, and an ice cold Michelob ULTRA Pure Gold. Or, if you’re looking for a place to cool off in between waves, head over to the Michelob ULTRA Pure Gold Breaker Bar at the South end of Perkins Lake near Partner Village to catch some shade, more free giveaways, games and more. Take an adventure with Jeep® Ambassadors Jordy Smith and Malia Manuel in the new “Jeep Sessions: A Surfing Journey in 360°,” which will be featured in Jeep® brand’s Virtual Reality activation located in the Partner Village. Jeep Ambassadors Jordy Smith and Tyler Wright will be stopping by the activation for a meet & greet / signing session. T-Mobile is setting up the Un-carrier Lounge in the heart of the WSL Surf Ranch, with great views of the competition, a phone charging bar, and custom giveaways. The carrier is also the presenting partner of the in-broadcast Barrel timer and “Dialed Moments” series, featuring Founders’ Cup athletes’ previous best rides on Kelly Slater’s wave. Stop by the Quiksilver tent in Partner Village to check out the latest in boardshorts and gear, get a free hat, and enter for a chance to win a $500 gift card. LifeProof will be bringing out their full suite of products including their FRĒ Cases, AQ9 Speakers, Battery Packs, Charging Cables, and New Backpacks. WSL PURE, the WSL’s non-profit ocean conservation program, will promote its NGO partner Surfrider Foundation onsite in Lemoore with the Founders and through the event broadcast.